Firkin Around...Any Beer Town, USA. Many of you may have traveled to another part of the country and discovered a beer that you have never tried before. It may be because that brewer does not ship into your state or in some cases, the brewer does not ship beyond the borders of their own state. You may have fallen in love with that tasty brew and wished you could get some home. After you hung your head and silently weeped, you resigned yourself to the fact that unless you come to these parts again, it's not likely you'll sample this brew in the comfort of your own home. Other items, such as alcoholic beverages (beer, wine, liquor), are not considered hazardous but are prohibited and boxes displaying such markings are also prohibited. The shipper must be a licensed entity and the shipment must originate and terminate in one of the states listed in the Wine Shipping State Pairing Guide as a direct-ship, intrastate, off-site or on-site purchase state. When shipping via FedEx Express® and FedEx Ground® services, shippers are encouraged to obtain their customers’ business addresses, which typically makes it easier to obtain the required adult signature. For ground service to residential addresses, shippers are encouraged to use FedEx Home Delivery®. 1FedEx Express does not transport wine into, out of or within the state of Massachusetts. Alas, wine wins out in the least. What's a beer lover to do? Take heart my friends. With a little planning and some effort, you can enjoy that magnificent beer at your home, too. Fortunately we all have a friend in Southwest Airlines. They allow for two items of checked baggage to 'fly free' so long as each is 50 pounds or less in weight. And since they fly to great beer destinations like Colorado and the US Northwest, you can score some beer when you fly there, too. Click here for the skinny on Southwest's regulations concerning alcohol transport. Think of it as 'gluggage'! Get yourself a cooler with wheels and a travel handle. Coleman's 50 quart cooler fits the bill quite nicely. Your local shipping store or office supply should have the single bottle bubble wrap pouches available for purchase. If not, buy yourself a small roll of bubble wrap and some packaging tape. You will need a small box of the quart sized zipper lock sealing plastic storage bags. Finally, get a good quality luggage strap to use around the cooler to ensure the lid stays closed during transport. I have found that a 12 fluid oz.bottle of beer weighs about 1.5 pounds, thus a six-pack will weigh around 9 pounds. You will be able to bubble wrap and bag 18 bottles bringing your total to 27 pounds. Those 'bomber' sized bottles are around 2.5 pounds each, so you should be able to wrap and bag three of them for a total weight of 7.5 pounds. The beer/glass/packaging weight will be around 34.5 pounds. Since the cooler is 15 pounds, you'll be right at the 50 pound limit for a free bag. DO line the inside of the cooler with some large bubbled, bubble wrap for extra cushioning. DO keep the bottles upright in the cooler. Saves room and no worries of cap contamination. DO use a permanent marker to write your address and contact info on the inside of the lid. DO use a luggage tag on the outside of the cooler. DO Bring the coolers to the check in area inside the terminal where an official can inspect. DO have the coolers transported to the plane by a baggage handler, rather than having the attendant place them on the conveyor. This will keep them from any overturning or violent shaking. DON'T put ice in the coolers. It's not like you're going to have one when they come off the baggage carousel. DON'T fret over extreme cold or pressures. Remember, the cargo hold is pressurized and relatively cool. Fido travels down there too! You will find that the travel coolers will consume some weight that could have been a few extra bottles, as opposed to using cardboard boxes. Fear not. It will insure that your suds will be further protected through your travels. In addition, the wheeled coolers with their telescoping handles will breeze you through the airport with your beer. So if you choose to go with two coolers, then pack your one carry-on lightly, don't forget your toothbrush and a change of underwear! If you're like me, the next time you cry over beer, it will be tears of joy when you see those coolers at your destination, on the luggage carousel, knowing that they are yours to enjoy ! Sarasota. My town. Craft beer is here to raise your spirits and your pints. Here is a wee bar with a wee bit o' history. The Shamrock has been a tiny but humble part of the Sarasota turf for many years. Over 40 if I'm not mistaken. You can get a glass of wine or your favorite brew in this quaint pub on Ringling Boulevard. 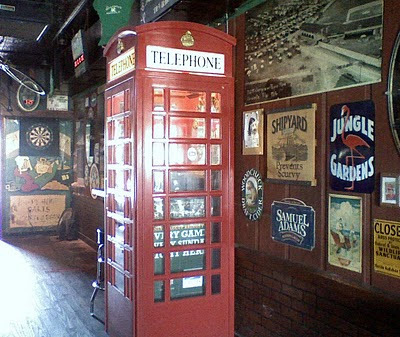 There's plenty of brew signs, flags and beer memorabilia, along with a unique UK call box right in the middle of the pub. The only call you won't be missing will be last call! 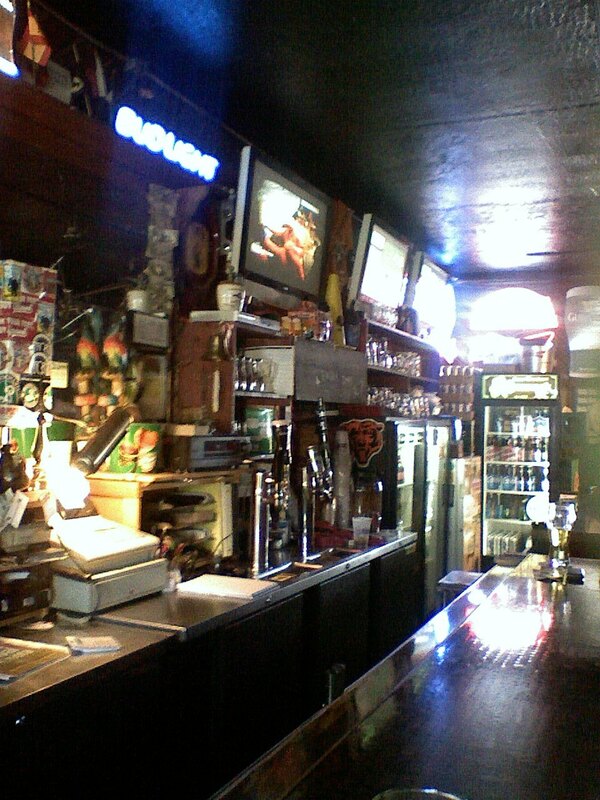 Two dartboards and a bar game, along with just a couple of televisions are there for your distraction between pints. The conversation will keep you entertained as well. As my ramblings have taken me through bars across the land, I can tell you one of the measures of a good bar is the quantity and array of beers, both on draught and in the bottle. But one of my favorite personal measures is if a bar carries one of the best blended Irish whiskey products you ever laid eyes or lips upon. That my friends is none other than Tullamore Dew. Uisge baugh. The tears of Angels. Lo' and behold, tucked up neatly on a shelf near the back of the bar, sat a crock of the delectable dew. Though the bottle was empty, (no whiskey here), it made me glow that this bar had already exceeded my expectations. 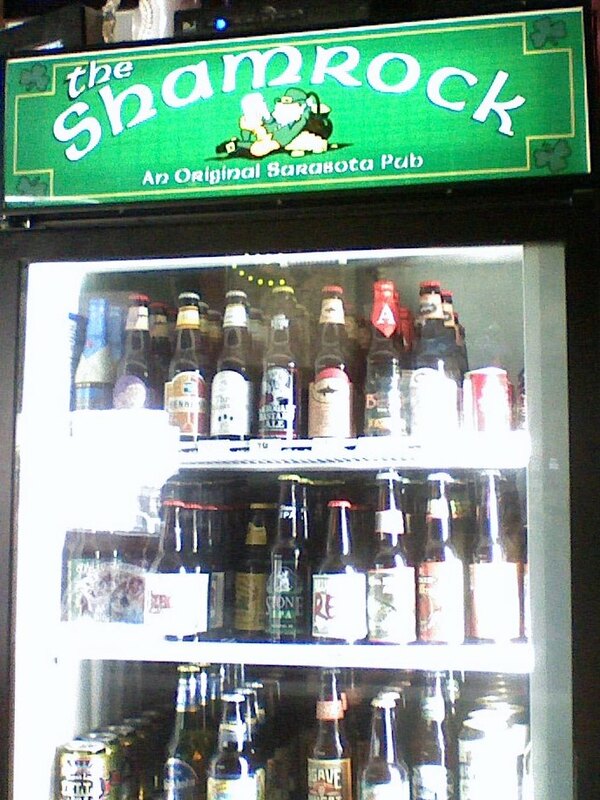 Back to the beer selections. There were two tap stations that dispensed about five draught beers apiece. Good and varied selections, I would add, many uncommon to typical watering holes. 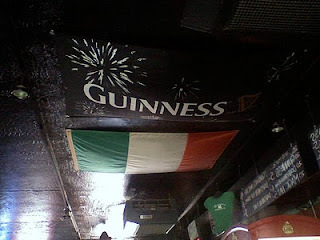 Mainly they were American craft beers, but true to their Irish roots, a nitro 'sheleigly' of Guinness was prominently on display. A fridge at each end rounded out the bottle and can selections with everything from PBR up to some hard to find micro brewery selections. Cripes, they even had a few cans of sparkling white wine in stubbly little pull top cans. Our hostess, Aly, was friendly and a great beer enthusiast. An easy going conversation about good beer and good local beer establishments ensued. Cozy, quaint and comfortable. Atmosphere and character abound. Returning our attention to the interior of the bar, you notice among the many beer signs hanging are some large photos of old Sarasota. The pictures are from the surrounding neighborhood; some from over 70 years ago. There is one in particular of nearby Payne Park, complete with the old spring training baseball field. These super sized photos give new meaning to the expression, "...if these walls could talk!" Interesting bits and pieces of what it takes to run a bar are all around you. Tap handles from spent (or perhaps incoming) kegs are tucked in the nooks and crannies along the bar-back. Lots for the eye to take in and absorb in one sitting. There is a door at the opposite end of the lengthy expanse of a room. It leads out to the back of the building and also serves as an alternate entrance. 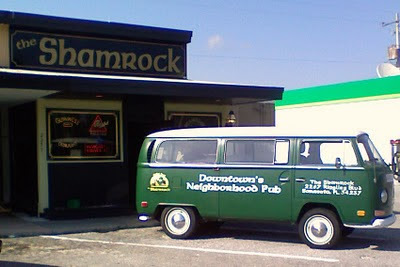 At times, The Shamrock is host to some of the latest musical artists the Sarasota Bay area has to offer. I will be back to check that scene, for sure. Prices for beers and ales are very reasonable. A tiny gem of a spot right in the downtown area, just off the beaten path. Be prepared to be nicely surprised.